Ely Cathedral is widely acknowledged as one of the most beautiful Cathedrals in Europe and was recently voted in The Times as one of the 'top 20 must see buildings in the UK'. 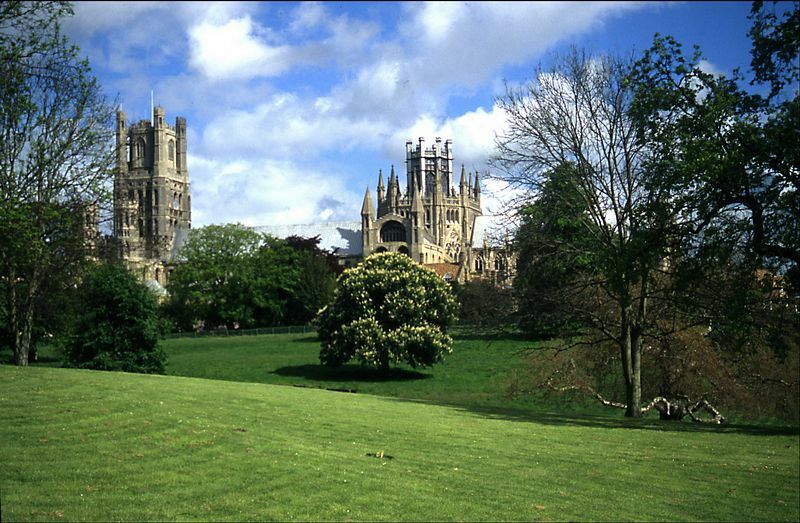 Known as 'The Ship of the Fens' the history of the Cathedral dates back to 673 when St. Etheldreda, Queen of Northumbria, founded a monastery on the Isle of Ely where she was Abbess until her death in 679. In 1081, work on the present building was begun, under the guidance of Abbott Simeon. It was completed in 1189 and the Cathedral now stands as one of the most remarkable examples of both Norman and Romanesque architecture. History is abundant in this Cathedral and includes tales of King Cnut, Hereward the Wake, William the Conqueror and Oliver Cromwell to name a few. Undoubtedly, the most outstanding feature of the Cathedral is the Octagon, built to replace the Norman tower which collapsed in 1322. The scale, engineering skill and sheer beauty are breathtaking and we can only marvel at the vision of Alan of Walsingham in designing such a piece of architecture. The 14th Century Lady Chapel with its intricate stone carvings, is the largest in England. And there is the Prior's Door, the painted Nave ceiling, Bishop West's Chantry Chapel and St Ovin's Cross - the only piece of stonework of Saxon origin in the Cathedral. The Cathedral is positioned within the walls of the Benedictine Monastery, and a walk round the College will reveal that Ely has the largest collection of medieval domestic architecture in England. The Porta was the original entrance to the Monastery and Prior Crauden's Chapel is situated nearby. Powchers Hall, the Old Barn, The Almonry and all the other Medieval buildings still stand to remind us of a community who lived and worshipped together, and of the skill and craftsmanship of those who built them over 600 years ago. Access to the Cathedral is limited during service times and on some special weekdays. (Please check website for details). No charge for children in family groups. No admission charge to ground floor on Sundays. There are other ticket types available if you wish to ascend the Octagon and West Towers. 15 miles north of Cambridge on the A10. Coach parties may alight near the West Door - coach park nearby in Barton Road. Several large free car parks in Ely.